Soybeans can be harvested as a hay or silage crop. This option is often considered either when forage is short or when the soybean crop is damaged for harvest as a grain crop (for example. following hail damage or an early frost). Soybean forage, like most legumes, tends to be high in protein and low in fiber (relative to grasses) making soybeans an excellent forage if harvested properly. The major limitations to using soybeans for forage are their low yield potential and the fact that many soybean herbicides are not labeled for use when soybeans are harvested as a forage. The forage yield potential of soybeans can be as high as 4 to 5 tons per acre. However, yields this high are seldom observed in the field, particularly when an emergency decision is made to harvest the soybeans as forage. Yield of soybeans can be maximized by planting early. Soybeans may be planted as late as mid-June as an emergency crop however yields will be reduced to 1 to 2 t/a dry matter per acre with the late plantings. If the decision to harvest as forage is made at planting one should plant a late maturing variety. Late maturing varieties tend to grow taller and produce more forage. Studies by Hintz et al. (table 1) indicated little effect of plant population on soybean yield above 100,000 plants per acre. However, narrow row spacing (7 inches) produced more forage than wide spacing (30 inches). The major limitation to emergency use of soybeans for forage is the fact that few herbicides are cleared for use on soybeans harvested for use as forage. If the decision to harvest for forage is made after a application of a herbicide not cleared for use on soybeans harvested as forage, it is not legal to harvest the soybeans and used them as a forage. As of this writing the herbicides that have clearances for feeding the forage to cattle are: Basagran, Lasso and all other alachlors, Dual, FirstRate, Sencor, Prowl, and Roundup. Check the label for information concerning specific intervals between application and harvest. However, if the decision to harvested for forage is made early, then timely cultivation may eliminate the need for herbicides. If herbicides are necessary for weed control, careful selection of the correct herbicide will allow use of the soybeans as forage (table 2 and check label on container). It is also important to remember that weed control need not be as stringent when soybeans are harvested for forage as compared to grain production. Some weeds can be tolerated, especially in late season, with no effect on yield and small effects on forage quality. The optimum time to harvest soybeans for silage is when seeds completely fill the pods and the lower leaves of the plant are just beginning to turn yellow (just before R7). At this point the field has achieved maximum dry matter yield and is beginning to decrease in moisture content. Soybeans harvested later will have higher oil content which reduces their ensiling characteristics (mixing grass at ensiling will help later harvested soybeans). Some field drying is necessary before either ensiling or making hay from soybeans. They should be harvested with a mower and conditioner. Conditioning hastens stem drying so that leaves and stems dry at more similar rates and leaf loss is reduced. Harvesting soybeans for hay is generally not recommended because drying time is increased relative to silage harvest, increasing the likelihood of rain damage. Leaf loss is also increased so that crude protein of the harvested forage is reduced. Additionally, soybean hay is often dusty and the stems are very brittle increasing feed bunk refusal. The latter can be reduced by good conditioning at mowing. Soybeans should be harvested at earlier stages for hay than for silage. Soybeans harvested for silage should be harvested with a mower-conditioner and dried to 65 to 70 % moisture for storage in a silo tube or bunker silo or dried to 60 to 65% moisture for storage in an upright silo. Pure soybean silage is not very palatable to cattle. Palatability can be increased by mixing the soybeans with a grass at harvest. It may be possible to mix the soybeans with a grass, such as corn, sorghum, or sudangrass, at harvest by direct cut. If the standing grass is dried below 65% moisture, then alternating rounds of soybeans and the grass may be chopped and mixed at the blower as the wagon is unloading for a final moisture appropriate for silage fermentation and storage. Some Ohio data has suggested that a 2 to 1 ratio of grass to soybean (dry matter basis) is optimum. This will frequently happen if equal rows of each are harvested in alternating pattern due to yield differences. The other advantages of mixing with the grass at harvest are to provide additional energy for fermentation from the grass and to dilute the protein of the soybean to that needed for the animals being fed. Mixing with grass may also improve silage fermentation characteristics if beans have begun to form and the forage has a high oil content. Most feeding trails that have been conducted on soybean silage or hay were conducted many years ago, however the response would likely be the same if studies were repeated today. Soybeans cut in Kentucky when beans were 3⁄4 mature resulted n greater gain than when cut later. Similar findings were noted in Illinois and Indiana. A feeding trial in Iowa showed that soybean hay was nearly equal in value to alfalfa in terms of milk and butterfat production and one in West Virginia showed greater production from soybean hay. Anthony, E.L. and H.O. Henderson. 1923. Soybeans versus alfalfa hay for milk production. WV Agric. Exp. Sta. Bulletin 181. Cannon, C.Y. 1947. Feeding soybean hay and silage. Hoard’s Dairyman 92:753. Hintz, R.W., K. A. Albrecht. 1992. 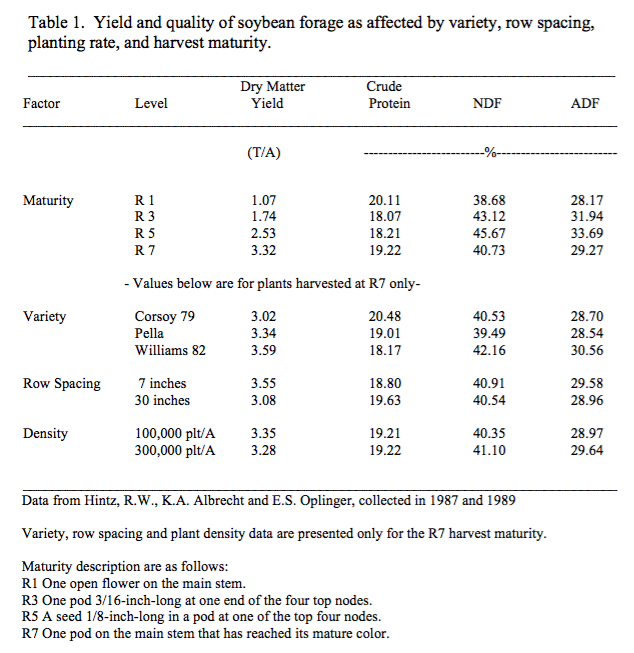 Cultivar and management practice effects on dry matter partitioning and forage nutritive value of soybean plant components. Agron J. 86:59-62.